Turtle has a new pair of gaming headsets designed specifically for Battle Royale games and game modes. Starting on the mid-range, the Turtle Beach Stealth 300 is an amplified gaming headset for the Xbox One and Windows 10 PCs – there will also be a PS4 version with some missing features. The wired cans feature 50mm speakers that have been tuned to deliver Windows Sonic surround sound. Additionally, a built-in, battery-powered amp will enhance your audio for 40-hours. As with the Turtle Beach Stealth 600, the Stealth 300-series now features a ProSpecs glass friendly design, metal-reinforced headband, memory foam ear cushions and a flip-to-mute microphone. The Turtle Beach Stealth 300 will retail for $79 (about £60, AU$100) starting this July. One tier down is the Turtle Beach Recon 200 is an entry level gaming headset fully compatible with all platforms including the Xbox One, PS4, Nintendo Switch, PC and mobile phones. For only $59 (about £40, AU$80), the Recon 200 ditches the virtualized surround-sound technologies and has smaller 40mm drivers compared to its mid-range brethren. 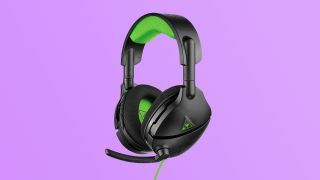 That said, the headset still features a built-in amplifier to enhance audio and boost bass for 12-hours on a single charge. You’ll be able to pick up a pair of the Turtle Beach Recon 200s later in the year this September.